International Respect for Chickens Day falls on Star Wars Day. When I created my first Duck Lords of the Sith blog in 2005, I didn’t notice this coincidence. Every year I do a special Respect for Chickens write up, alas, the originals are gone, the subsequent posts are in private blogs now, but I did mention it publicly last year here. I eat chicken. I love raising chickens. 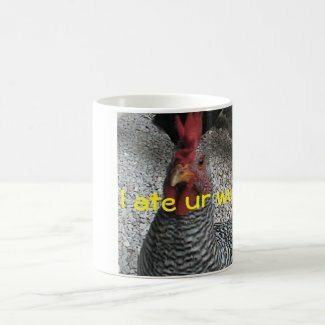 I’ve lived with chickens most of my life. I know a LOT of stuff about chickens. I’m also an awful person. I once tweeted a link to a youtube of one of my chickens eating Kentucky Fried Chicken on Respect for Chickens Day. Sorry, that youtube no longer exists. I realize that was in very poor taste for some of my followers. One of my big hangups, with all due respect to chickens, is Mike the Headless Chicken. (That version has been greatly softened up, the truer version is here.) Most people that run into this story spew forth amazement and all kinds of awwwww, but this true story ticks me off to no end, and I’ll tell you why- it’s the sickest most horrible story of animal maiming I’ve ever seen, and I’ve seen loads of abused, neglected, and outright tortured animals in my life. I grew up butchering chickens, and I always took plenty of pride in nicking heads off with a sharp hatchet on the first try, then holding the feet and wings back during the bleed so the body wouldn’t bounce around getting damaged. I’ve never understood letting beheaded chickens flop around because it’s messy, not to mention it causes bruising and broken bones. I know the chickens can’t feel it any more, but I don’t think it’s funny to watch, and I don’t like poor quality food. But that’s way beside the point. Mike was a very badly botched butchering attempt. The guy was grabbing, beheading, and tossing chickens into a flopping pile, and noticed one of the beheaded chickens didn’t just flop but actually stood up and walked around. Without a head. *Walked* *around*. I felt sick as soon as I read that part. I know from experience that he chopped through the head and not beneath it. Chickens have sooooo many feathers that it’s hard to see what’s actually going on under there, but that chicken still had enough brain attached to function like a normal chicken. Without a head. Without a FACE. No eyes, only one ear, no mouth. In my worst nightmares I can’t imagine what it would be like to walk around without a face. It would be far beyond being blind. Imagine poking food in at the top of your neck. Because that’s what the farmer did. He kept that chicken alive with a syringe, which he used to squirt food down it’s throat, which was open to the world. Without a face. I’m all for science studying this situation and learning from it. I’m all for being amazed. What I find distasteful is that this chicken was not put out of its misery right away. Thanks to feathers, no one saw scars. That the bird automatically tried to act like a bird isn’t cute at all. Imagine you having an itch driving you mad and you can’t scratch it. The preening it tried to do without a head? I didn’t read a singe response anywhere about that poor chicken needing and getting skin and feather care. Chickens preen several times a day as part of their hygiene and maintenance routine, so the first thing I think when I read about how amazing it is that this rooster tried to preen itself without a face and beak is how miserable he might have been with itchy skin and ruffled feathers. When I read about Mike, I don’t see anything about even basic skin care. And his death? His owners forgot his feeding equipment, if that part of the story is really true. It’s not clear whether that had anything to do with the rooster choking to death. The story *now* says they woke up to sounds of him choking, but the original story went into more depth about the difficulty they had getting food into his esophagus. It’s very likely, in my opinion, that he choked on liquids they tried to force feed without the syringe. His airway had no protection at all. Imagine someone trying to get you to swallow without your face and tongue to help guide it and aspirating on it instead because your windpipe caught spillover. Imagine not having any way to say stop, or wait, or help. The fact that this chicken was kept alive for 18 months beyond losing his face and part of his brain is testament to the patience of his owners. As anyone who has owned any kind of bird can say, birds require special care and nutrition. However, being covered with feathers also belies health- no one can see malnutrition, disease, and parasites through a mass of feathers. I can’t logically assume this rooster was healthy for 18 months after being so badly maimed just because it was kept alive to tour the countryside, and then suddenly choked in the night. Now, think about all this stuff you just read while you watch this, because it’s not hard to create another headless chicken to be amazed by. Imagine people mutilating several chickens trying to recreate Mike the Headless Chicken, because other headless chickens pop up every little bit, seemingly in attempts to sensationalize and get noticed. Can you imagine if someone did this to any other animal? Click this pic to go to the video.